Ryder (Dolph) is a mysterious man on a motorcycle who rides into a dusty ol’ southwestern town. Knowing only that he always carries his bible around, and that he likes tequila, be befriends a family of Native Americans, but makes enemies with the local (and prerequisite) evil land baron, Reno (Tompkins), and his goons. 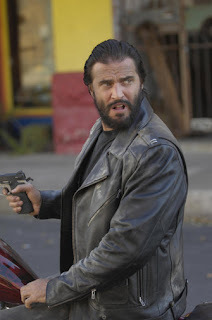 Reno even tries to get some bikers to take Ryder down, led by the charismatic Jarfe (Enos III). Reno wants to take the land from the Indians (if you can still call them that?) and build his own casino. But Ryder doesn’t approve of his ruthless, murdering tactics, so he deals with them the only way they understand: with some shotgun justice! Will Ryder rip the bolo ties off this new crop of middle-aged punks? The idea of Dolph as a preacher on a motorcycle who comes to clean up a town sounds good on paper. And in some ways it does work. But this rehashed plot is nothing new, and it lacks a certain verve. Taking liberally from Pale Rider (1985), The Outlaw Josey Wales (1976), Billy Jack (1971) and Walking Tall, 1973 (to name a few obvious examples), thanks to some boring, talky bits and some weak, jerky, short fight scenes, a lot was left to be desired from these “Dolphings With Wolves”. We don’t want to go too hard here, as there are some cool parts herein. John Enos III of Bullet (1996) and Stealth Fighter (1999) fame unquestionably steals the movie as Jarfe. He only shows up towards the end, but he should have been the main villain instead of Reno. 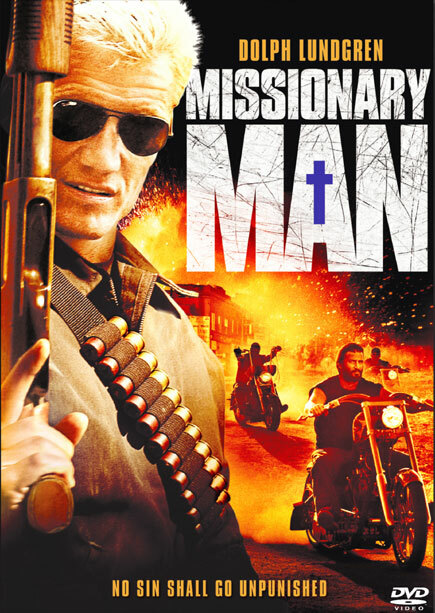 As stated earlier, Missionary Man boasts a cool concept, but it’s just so derivative, it becomes hard to be invested. To overcome this, there should have been more excitement and edge. The movie needed a literal and figurative punch-up. And it doesn’t hurt that the colors on the DVD are all weird. Supposedly there were some technical issues that weren’t resolved in time, so the movie has a washed-out, grainy look that doesn’t do it any favors. But if you always wanted to see Dolph instead of Lamas in an episode of “Renegade”, here you go. Plus Lamas’ name in “Renegade” is Reno Raines, and the baddie here is named Reno. Coincidence? But there’s no denying Dolph is cool, and his CSI-like trading of his sunglasses for granny-style reading glasses is a nice touch. But his coolness alone isn’t enough to overcome the flaws of Missionary Man. The bottom line is the Missionary Man concept should have gotten a better execution. Yes, it’s run-of-the-mill plotwise, but there are some definite standout moments. It’s tough, but we just can’t put our full blessing behind Missionary Man. I completely agree. It was such a cool concept. The mysterious figure comes into town shooting guns and reading the bible. But it was so slow and had way too many scenes of endless dialogue and not nearly enough action. And the action that was there was nothing to get excited about. One of the bigger missed opportunities in his career for sure. Yeah, the movie looked like an Old Times Photo come to life with all the sepia tones and what-not. That was about the only thing really memorable about this one. Middle of the road all the way. RobotGEEK: Your comment is so true! The potential was there but it wasn't fulfilled. Videovacuum: Can't agree more! Sepia tone could be cool but it wasn't supposed to look like that. It was so sort of glitch in the post-production. Venom: We agree with your comment 100%. The movie definitely needed more Jarfe. This movie didn't have to be boring at all. This is Dolph we're talking about here! It should have been a big battle between Enos III and Dolph. I never heard of this movie but it does sound like a cool concept. I heard of the director Dolph Lundgren. 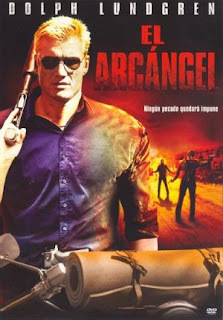 Yes it is a cool concept and Dolph is entertaining as always, but the movie didn't work. Unfortunate. The concept sounds so fool-proof. It really is. Thank goodness for John Enos III who saved the movie from being a total dud! Im a little amazed that it is possible to make it look like this unintentionally...thats right out weird. One should think post production is a highly monitored process,lol. Lol, you would think so! Hopefully one day, Dolph can put out his original version. all i can think about is eurythmics. someone need to make a eurythmics music video with footages from dolph movies. Haha, would love to see that! What I loved about this one was, plot-wise, it was pretty much a group of thugs driving around in a pick-up truck and cornering Dolph, and him beating the crap out of them. 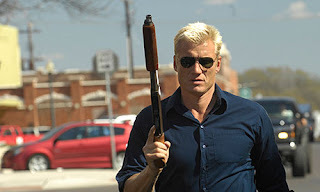 The Dolph directorial film effects were a little much, but otherwise this was a fun Dolph time. Also agree on Enos. That was pretty funny, but it should have been more like The Russian Specialist in its action scenes. Enos stole the movie though!